Life can get thrown of course in an instant. That’s what happened to 2.5 million Nepalese as the two massive earthquakes of April and May last year destroyed their homes. More than 8,000 people lost their lives and over one million children were left without a school. The world rushed in to help. Governments, international organisations and private individuals donated millions to assist victims of the disaster. Monday, 25 May was one year to the day since the earthquake struck. So how are Nepal and its people doing now? Let’s begin by popping into a bamboo school in downtown Kathmandu. 12-year-old Yuna Shrestha has a broad smile on her face. “I liked my old school a lot, but I feel much safer in this bamboo classroom”, she says inside her temporary learning space. She is wearing a neat school uniform and has decorated her braided hair with beautiful red flowers. The earthquake is already a distant memory for bright, maths-enthusiast Shrestha. She prefers to look ahead. “I want to become a doctor”, she says. Shrestha is one of eighty pupils studying in temporary learning spaces built from bamboo by Finn Church Aid (FCA) at the Padmodaya Higher Secondary School. The 70-year-old main building of the school collapsed in the earthquake. Fortunately, it was Saturday, a day off. Had the earthquake taken place on a week day, Nepal would have lost many more teachers and children. The school ground is now filled up by five temporary structures made out of bamboo, standing side by side. The sheet-metal-roofed bamboo structures are light, but sounds travel from classroom to classroom through the thin walls. After extended use, the walls are already showing signs of wear and tear, but the structures still serve their purpose, according to teacher Suddha Pathak. Ms Pathak explains that the teachers don’t know when a new, permanent school building will be constructed. “It is probably going to take at least one more year”, she believes. She says the lives of the school and the pupils have returned to normal. This sentiment is shared byLalita Khadki, who has brought her two daughters to school, even though she still fears that an earthquake will strike again. “We still think about the earthquake. We are constantly on our toes. My daughters want to sleep in their clothes so that they can quickly run outside in case an earthquake hits”, Ms Khadki says. Fear has not completely left the minds of people in Nepal, but for the students of this school things are looking quite good. The destruction suffered by the capital Kathmandu was less severe than originally feared. Unfortunately not all Nepalese were that lucky, far from it. Even though the capital city survived the earthquake with relatively limited destruction, the rural areas suffered gravely. In the worst hit regions entire villages were left with only a few habitable buildings standing, and hundreds of thousands of Nepalese are still living in the cramped huts they put together in a hurry from corrugated iron sheets and tarpaulins. The people, who have lost their homes, will most likely have to spend another monsoon season and winter, if not even longer, in their temporary shelters. People in the rural regions are poor and building materials expensive, and so the people have been waiting for a support package promised by the government to begin rebuilding their homes. So far their wait has been in vain. The Nepalese government gave the task of building temporary learning spaces to non-governmental organisations which were very effective in their response. But rebuilding residential buildings was a task the government reserved entirely for itself. For a moment things looked promising: in July 2015, the international community promised 3.6 billion euros for the rebuilding of Nepal. The government in turn promised a grant of 200,000 rupees (approximately 1,700 euros) to the people who had lost their homes, provided that they would rebuild their homes in accordance with government approved building plans. The intention was good, in principle. The new plans would result in earthquake resistant buildings. Unfortunately neither the plans nor the money has been delivered. And so, the Nepalese have not been able to begin rebuilding their homes, especially since they have been told that building without a government approved plan will result in losing the promised government grant. First, the quarrelsome Nepalese government spent months arguing about which government official from which political camp would be allowed to oversee the National Reconstruction Authority (NRA). Then it took the NRA a good while to decide on the technicalities of reconstruction. The Nepalese newspapers have written almost daily about new delays in starting the reconstruction. A year has passed and the promised funding has still not been distributed. At least the NRA managed to organise a contest for its logo. Kafka would have felt right at home in Nepal. What has happened in Nepal is what often happens in disaster situations: people’s greed and power play step in. But we must not give in to frustration. Lots of good has been done. Immediately after the earthquake, emergency assistance was delivered, and victims of the earthquake got access to food, medication and building materials for temporary shelters. The spread of diseases was prevented, and thus an even greater humanitarian catastrophe was avoided. And children were quickly able to return to school. Even if the response of the Nepalese government has been stalled by internal bickering, international humanitarian organisations have been hard at work. Finn Church Aid, for example, built 170 temporary learning spaces within a few months enabling thousands of children to resume their education quickly. In addition, teachers were given additional training on managing the post-earthquake situation, so that they would be able to properly react to their pupils’ potential traumas. 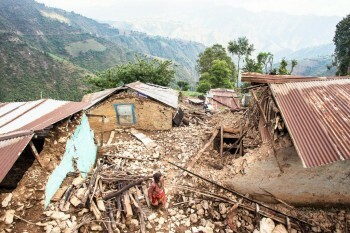 The work continues, and FCA’s relief project in Nepal has reached a new phase. FCA has been tasked with building 600 temporary classrooms to remote and hard to reach regions. Temporary learning spaces are still needed, because permanent schools aren’t expected to be finished for another three to five years, and at the moment, education is severely hindered in these regions. “It depends on the location. Pupils may have shorter school days because the remaining classrooms must be divided between many classes. Two or three different groups and teachers might be in the same classroom at once”, says Merja Färm, Finn Church Aid Humanitarian Coordinator, about the situation in regions where temporary learning spaces have not yet been constructed. “Children might also be studying in damaged or dangerous classrooms. Of course in many schools, parents and communities have put together temporary classrooms. Made of sheet metal they’re usually quite a sight”, Ms Färm says. As well as temporary learning spaces, FCA is also constructing 14 semi-permanent school buildings in remote regions that, for one reason or another, were not included in the reconstruction plan of the Nepalese Ministry of Education. These buildings will last for at least 20 years. Approximately 25 structurally solid school buildings are fixed, and those beyond repair are torn down to make way for new ones. FCA is also building 378 latrines around the disaster affected regions, and continues further training for Nepalese teachers, and psychosocial support to both students and school personnel. Funding for these new projects comes in large part from the EU and UNICEF, but individual donations are still needed to cover the entire expenses. Through these new relief projects, Nepal is one step closer to recovery. The Nepalese people and the relief workers working for them deserve our support. One year after the earthquake I think of the people I’ve interviewed and met in Nepal over the past year. I think of the everyday heroes. I think of 26-year-old Roji Bariya, whom I met standing in front of her collapsed house in Kathmandu’s neighbouring town Bhaktapur with a hopeless, vacant look in her eyes. Has life already found its way back to those eyes? 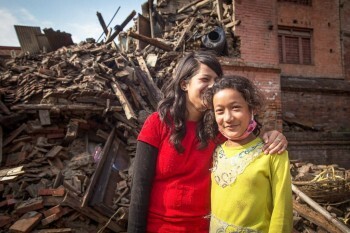 I think of 25-year-old Sabita Moktan, who was pregnant at the time of the earthquake. She has given birth to her child in a remote rural village. Where is she now living and raising her child? I think of the group of girls, who found reasons to laugh even when surrounded by the ruins of their hometown, despite the disapproving looks of the elders in the village. Their laughter gave me hope among all the destruction. I admire the unimaginable resilience that I’ve witnessed in ordinary Nepalese. Through some miracle they have held themselves together as the world around them has collapsed. For every story told there are countless left untold. I think of all those Nepalese whose story has not been told. They seem invisible to the politicians dragging their feet and drinking tea in the capital. It would be just as easy for the world to forget about the Nepalese, suffering in silence. But the world must not forget. It is not the fault of ordinary Nepalese that their government is weak, poor and corrupted. It is no reason to shrug and move on. We can be better. And we are: the people in Finland have already proved as much by donating money for relief efforts ever since the disaster took place. The crisis in Nepal is not over. In many ways it has only just begun. Rebuilding houses and reviving livelihoods could take years. The politicians might not listen to the silent ones in their country, but someone has to. We Finns, and the international community can listen. We must listen.